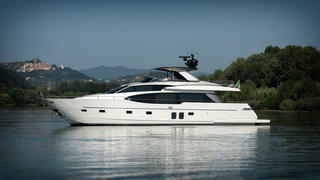 The first Sanlorenzo SL78 motor yacht has been launched, the Italian yard has confirmed. This 24.59 metre yacht serves as the entry-level model in the Sanlorenzo range, with its fibreglass planing hull sporting the Italian yard's trademark exterior styling, as created by Officina Italiana Design. The SL78 shares many of the impressive design features that can be found on the Sanlorenzo SL86, including a floating staircase that links the main deck to the upper deck, and cutaway bulwarks that allow the maximum amount of sunlight to filter into the floor-to-ceiling saloon windows. Sanlorenzo added that the SL78 boasts class-leading levels of space for relaxing on the sun deck because the transom garage means that there is no need to store the tender on the upper deck, as is the case on many yachts of this size. Accommodation is for eight guests split across a master suite, VIP cabin and two twin rooms, while there is crew accommodation for a staff of two. Power comes from a pair of 1,520hp MTU diesel engines. Sanlorenzo added that a further three SL78 hulls are in build at the yard's Ameglia facility. Other projects currently underway at the Italian yard include the 460EXP explorer yacht series, which has seen two hulls launched and a further three sold in less than 12 months. Looking further ahead, the yard plans to launch a compact explorer yacht in 2017, called the SX88.